Autumn is the season of change. The smoke of summer is gone. The nights are cool. The leaves are in their full glory. If only it could stay like this the entire year. But that really can’t happen. It’s not in God’s design. Flowers die. Leaves turn brown and fall to the ground, and what seem beautiful, turn into bags of fallen and dead leaves. Yes, autumn is truly a season of change. As men and women come to the Mission for restoration, they no longer need to worry about where they’re going to sleep for the night, or where their next meal will come from, and they can enjoy the beauty of the Southern Oregon autumn and focus on change. Change is inevitable, and as difficult as it may be, change is a good thing. And like the days of autumn, changes must be tak-en one day at a time. As men and women come to the Mis-sion and resolve to find a way out of homelessness, they soon realize there are many little things they can be doing for themselves that will help them through the winters of life. These may include signing up for services, reconciling relationships, work-ing as a team, serving others, learning new skills, or addressing past or present behaviors. As our program managers offer a caring relationship, a listening ear, a hand-up, change is certainly attainable for the vast majority of our guests. Yes, change is inevitable and autumn reminds us of change, but no matter what challenge comes our way, we need to remember one thing: God never changes. There is only one thing powerful enough to bring change that transforms hearts and lives from the inside out, and that is the Good News of the Gospel of Jesus Christ. This is why we continually share it in chapel services, Bible studies, mentor relationships, and one-on-one coaching. And as lives are changed, the churches grow, and our community changes for the glory of God. We want to recognize the following businesses that purchased and donated 4-H lambs and pigs to the Medford Gospel Mission to be used to feed families and individuals in our free restaurant, The Main Ingredient. We are blessed to live in an amazing community that is full of individuals, businesses, and organizations that are eager to help care for one another. As a faith-based Christian non-profit we rely completely on volunteers and donations. Every week over 125 people volunteer at our campuses, serving meals, sorting clothing, mentoring men and women, teaching classes, preaching sermons, and in many other areas of our ministry. Last month we highlighted families in our newsletter and we asked for help with a remodeling project. The response was incredible and our project is now complete. Spearheading the project was Helping Hands International, a ministry that shares the love of God through practical hands-on care. They send teams around the world to bring help and hope to hurting people! 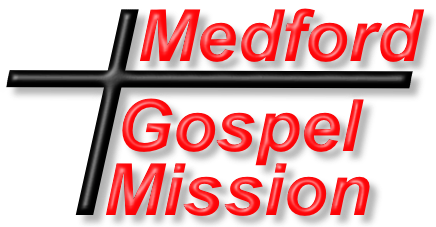 This year, along with sending teams to Mexico, Kenya, Dominican Republic, Nepal, Cambodia, India, and helping the victims of the Carr Fire, they decided to help us at the Medford Gospel Mission. A few months ago, they toured the Bartlett Campus for women and children and asked if there was anything they could do for us. Together we decided that we could really bless the families living at the shelter by building a playground where the children could have a safe and secure place all their own to play. Utilizing more than 40 volunteers, over the course of eight days, they not only completed the playground, but they were able to replace carpet, install windows and doors, as well as other general maintenance needs in the building. We are so very thankful for their help as well as the help of volunteers and donors to the Mis-sion. Without you we would not be able to restore people to a wholeness of life right here in our own community.